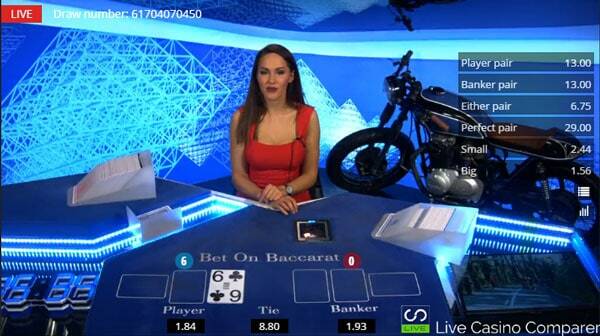 Betgames Bet on Baccarat - Review and how to play guide. 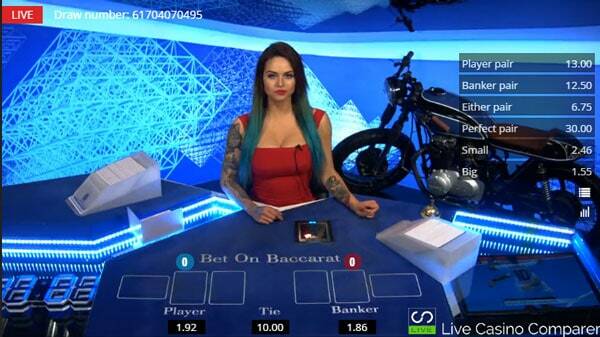 Betgames Bet on Baccarat is played exactly the same as normal Baccarat or Punto Banco. The same rules apply, the only difference is with normal Baccarat you place all your bets at the beginning of the game round before any cards are dealt. With Bet on Baccarat, you can place your bets before the cards are dealt and after the 1st cards are dealt. There is also a whole range of betting combinations and side bets that you can place, so it makes the game more interesting. All of the Baccarat Roadmaps are published as the shoe is being dealt, so if you’re used to using a playing strategy that relies on the roadmaps you’ll be able to use that to help you bet. The game is played with 6 decks of 52 playing cards. The shoe is changed when about 40 cards are left in the shoe. The game round starts with the initial betting round which is before any cards are dealt. 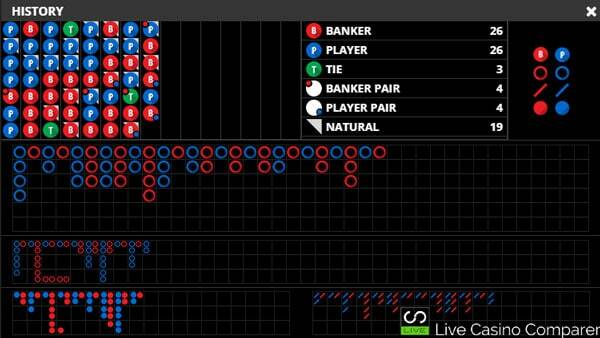 Side Bets of Pairs(Banker/Player/Either/Perfect), Big/Small. Colours – More Reds/Blacks, Equal Reds/Blacks, Next Card Red/Black. Totals – Players & Bankers points less than 9.5, Players & Bankers points more than 9.5, Total of Player/Bankers cards will be even, Total of Player/Bankers cards will be odd. Even/Odd – Players or Bankers points will be even, Players or Bankers points will be odd. To make a bet you click on the row that you want, then enter the amount of the bet in the box provided. you confirm the bet by pressing the “Place Bet” button. 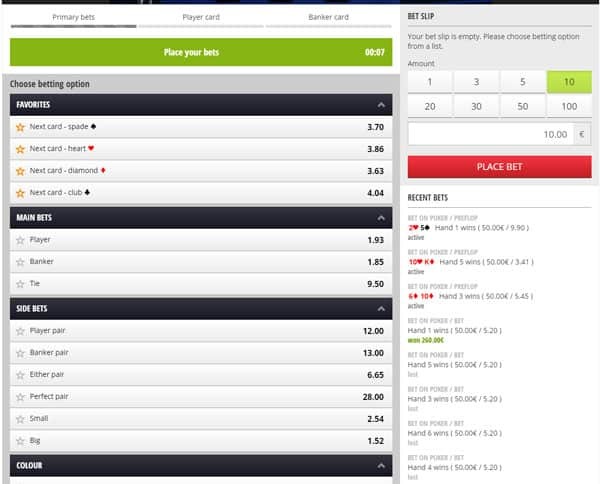 The bet is displayed in the recent bets window. The Player position is always the first card dealt. The Odds are recalculated and you can place additional bets. The Banker position receives the next card. The Odds are recalculated and you’re able to make additional bets. The player and Banker positions receive their second cards and a third if necessary (as per the playing rules). All bets are then settled. 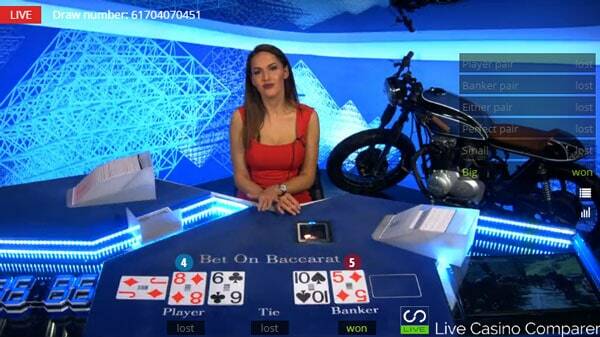 The Baccarat Roadmaps are automatically updated as the shoe is played out. A new set of roadmaps is created for a new shoe. I’ve created a detailed post on how to create and read the Baccarat Roadmaps and also created a playing strategy that I use when playing. There’s not much to the playing interface. You can adjust the volume and choose to display the Roadmaps and Side Bet odds and that’s about it. 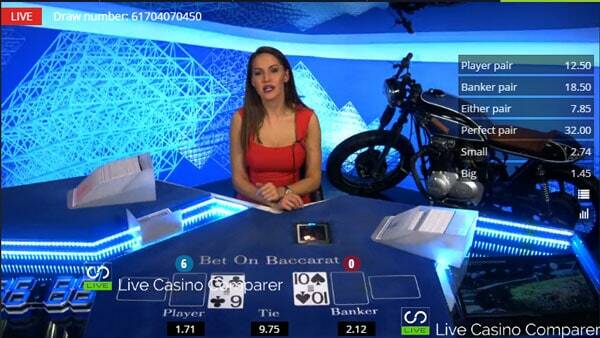 The historical results, information on the dealers, How to Play and Bet Histories are all displayed from the top of the viewing interface. Betgames publishes results for all of their games. You can go back months to see the historical results for Bet on Baccarat by using the BetGames Results finder.